Ahimsa Eco Solutions is comprised of Wesley Wright and Stefani Chan-Wright. Wes is an eco-geek from the concrete jungle, and Stef is a yoga teacher from the Borneo jungle. Moved by the overflowing garbage bins at a night market during our recent travels, we were galvanized to action: we had to help put a stop to all of the plastic waste that is generated. We decided to start with what inspired us in the first place: food ware. Like many people, we care about the planet and try our best to make good choices—but oftentimes there are so many options out there it’s hard to know which is the best. We've taken the guesswork out of it by offering some of the best solutions that are out there. First, no disposables — everything we offer is reusable. Second, non-toxic and recyclable or biodegradable — no leaching, no bisphenol-A (BPA), food safe, and able to be broken down in nature, by nature. We offer a very limited range of products so that there is no guesswork for you. You can rest assured that everything we offer is what we believe to be the best of what is currently available. 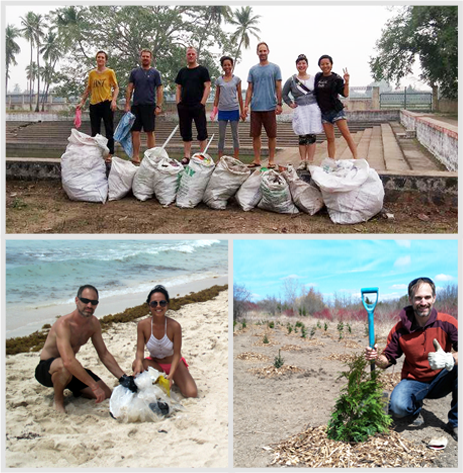 [Clockwise from top] A wedding site cleanup at a Hindu temple in Tamil Nadu, India (December 2016); tree planting in Ajax, Canada (Earth Day 2017); an ad hoc beach cleanup to collect plastic trapped in the seaweed in Tulum, Mexico (August 2017). A cleaner planet for us and our children. A zero-waste global society where everyone lives in harmony with each other and the planet. Ahimsa Eco Solutions offers environmental consulting services to corporations of all sizes (SMEs and MNCs), helping them to shift to a triple-bottom line (wherein economic, ecological, and social benefits are considered). The services that we offer include: energy and water efficiency; life cycle costing and analysis; green optimization for waste/resource capture and beneficial reuse; operational and supply chain analysis (for sustainability and resilience); transitioning to Zero Waste; and climate change planning (mitigation and adaptation). Wesley integrates his knowledge of different fields such as molecular biology/genetics, ecology, environmental engineering, critical thinking, ethics, urban permaculture, organic gardening, sustainable planning/design, and biomimicry to help clients realize their environmental goals.